What to do and see in Jaén? Jaén is a lovely province in Andalucía. It is also one of the least populated - the whole of Jaen, 13,498 Km², has just 628.000 inhabitants. The fact that for years it was one of the least visited province in Spain owes much to the terrible roads and communications leading to this province. But since the new motorways have been opened, and local roads improved, more and more travellers - from Spain and further afield - are starting to discover the delights of this beautiful and singular province. One of Spain's most important rivers, the Guadalquivir, crosses Jaén, adding to its attractive landscape and fertile lands. The Cazorla and Segura mountain ranges are visited by tourists all year round, attracted by the area's natural beauty and wealth of flora and fauna which thrive in its more remote areas. The province has four large natural reserve parks. The northern part of Jaen province has the largest plantations of olive groves in the whole of Spain, and indeed the production of olive oil is central to the local economy. The olives are picked by hand, and the olive oil produced here (D.O. Sierra de Segura and D.O. Sierra Mágina) has a distinctive aroma and, according to experts, rank among the best olive oils in the world. The province of Jaén was occupied by Romans during Roman occupation of Spain, and then by Visigoths until the Arab invasion at the beginning of the 8th century. Once finally reconquered by the Christians, the influence of Jaen grew, and in the 16th century the cities of Baeza and Ubeda were among the most important cities of southern Spain. Both cities still retain contain remnants of their former glory today, in their respective old quarters. Holy Week celebrations in Jaen are famous and people travel from all over Spain to watch the processions. Other important local include San Antón's Day in January when people gather round bonfires, eat and dance, Carnaval in February, Corpus Christi in June and finally Cruces de Mayo, a festival celebrated in many villages and towns throughout Jaen where people decorate the streets and patios with altars made of flowers to commemorate the Holy Cross. With just 116,012, Jaen is the least populated capital of all the provinces in Andalucia. In its old quarter, it conserves some of what must have been a spectacular city. It is also home to the world's largest collection of Iberian objects. In the 1970s, a unique collection of sculptures dating from about 500 BC were discovered nearby and they are now proudly exhibited in the city's main museum. The Castle of Santa Catalina, built originally during Arab occupation, presides over the city of Jaen. The city has a thriving university - one of the oldest in Spain. Jaen does not have its own airport - the nearest one is at Granada, must 99 km. away. Market days are on Thursdays. The name "Jaen" is thought to derive from the old Arab word describing a place of rest on a caravan route, and indeed the city of Jaen was perfectly placed to provide a stopping place to armies moving from one main city to another during Moorish occupation of Spain. Arco de San Lorenzo: The only remains of the medieval Parish Curch of San Lorenzo is this arch, Gothic-Mudejar style, which was recently designated a National Monument. Cathedral: Built between the 16th and 18th century. Capilla de San Andrés: 16th century chapel. Inside is the chapel dedicated to Inmaculada. Palacio de Villadompardo: 16th century stately home which houses the Museum of Popular Arts and Customs. Arab Baths: Located in the narrow streets in the old quarter, underneath the Palacio de Villadompardo, these 11th century baths once belonged to Ali, a Moorish king of Jaén. Royal Monastery of Santo Domingo: Used to be headquarters of the University of Jaén, this impressive monastery is located within the district of Magdalena. Parador of Jaén**** in the impressive Santa Catalina Castle; Infanta Cristina****comfortable hotel with spacious rooms. Hotels in the Province of Jaén: Nature lovers read our detailed review of the Parador in Cazorla. Visitors looking for more rustic rural hotel, try Molino de La Farraga, also in Cazorla. There is another Parador hotel in Ubeda. Also worthy of mention, Hotel Puerta de la Luna in Baeza, set in a 17th-century palace. Baeza(click on link for further information). See also photos of Baeza. Ubeda (click on link for further information). See also photos of Ubeda. Cazorla. Beautiful natural reserve with wild deer, wild boar, buck, mountain goats, mouflon sheep, and all sorts smaller game and birds. 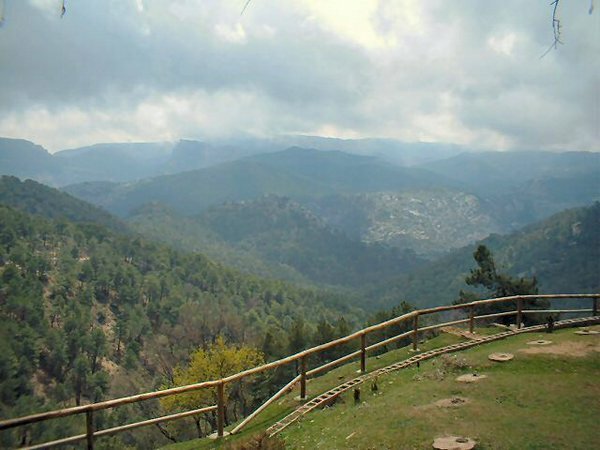 Sierra Segura: Located in the northeastern part of the province, this district forms part of the mountain system of the Sierras de Cazorla, Segura and Las Villas and occupies the northern part of the Nature Reserve. Mostly Mediterranean flora. Alto Guadalquivir: Located in the south-east part of Jaén Province, around the river Guadalquivir. Much of the district belongs to the Cazorla, Segura Las Villas Natural Park. Trout fishing is common. Sierra Magina: Located in the southern part of the province of Jaen, much of this district has been declared a protected Nature Reserve. Some of the highest mountain peaks are in this area. Farming is almost exclusively olive plantations. La Loma y Las Villas: Mountainous in the north, flatter in the south. 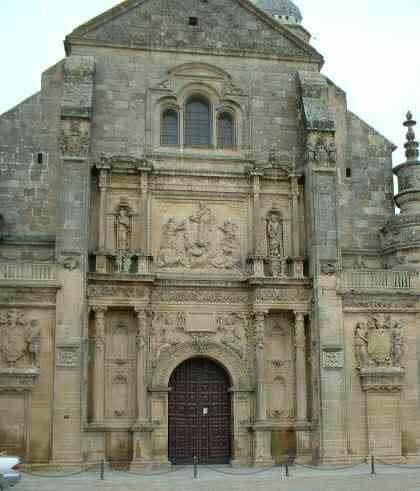 Historical towns Úbeda and Baeza are both found in this district. El Condado: Mountains covered with trees in the north of the Province. Good hunting grounds. Norte: As its name suggests, in the north of the Province of Jaén. The most important town in this district are Linares and Bailén. La Campiña: In the plains, mostly olive production with some other non-irrigated and irrigated crops. In the mountain areas, the relief system is made up of the Jabalcuz, la Grana, Grajales, Los Propios and La Pandera hills. Abundance of small game. Jaén: Olive groves, agriculture, timber industry. Flatter in the center and towards the north, more mountainous in the south. Sierra Sur: As it name suggests, the most southern district which borders with Córdoba and Granada.